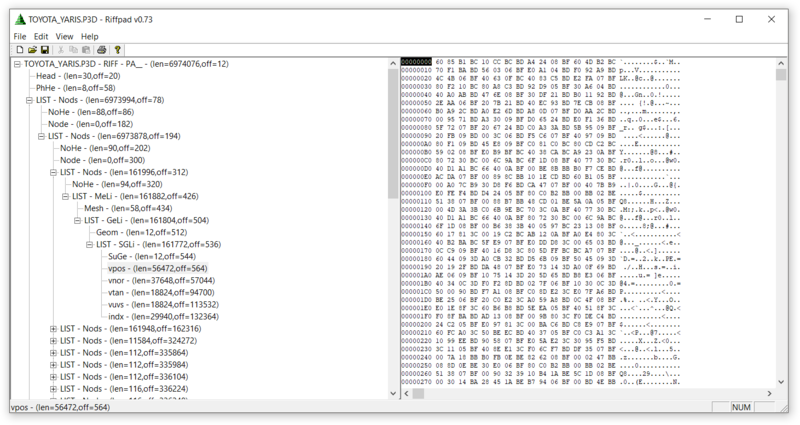 I attempted to use Ninja Ripper on the game in vain, but it turns out that aluigi wrote a script for WRC 7's PKG file formats and that using it reveals a surprisingly good amount of content, all conveniently labelled. That being said, the .P3D and .PTX files use RIFF as a container, but I figured there's more to it than just that. Maybe some of you 3D experts could figure out how to break this down so that we could port these cars to some other game easily. As I expect. Puzzle. Just few parts are on correct position + no wheels. +1 LOD inside which make mess. To build a model, a skeleton is necessary. Each part of the car is associated with a specific bone. It's not difficult to see that the structure of the riff file is similar to the parent-child pattern. Build a skeleton and then you can attach the wheels to the matching bone. Last edited by Szkaradek123 on Fri Nov 23, 2018 2:53 pm, edited 1 time in total. I presume this one has the UVs intact, right? Also, is it possible to get the skeleton data from the model itself or do I have to look elsewhere? The "NoHe" element contains information about the bone name and its local transformation (matrix 4x4) relative to its parent. And so for the "Piston_FR" bone the parent is "D_Main". For the bone "D_Main" the parent is "Root". And so on. The Mesh element has the "NoHe" element transformation and can be composed of more than one "Geom" type element. "Mesh" and "Geom" have the name of their "NoHe". Here is an example of using a recursive function to load a tree of bones (python). Blender importer for p3d files. How's the UVW maps on this though? For me meshes have uv mapping. And for you don't ? Yeah, it does check out fine. I just had to make sure that I chose the right export options for converting them to Wavefront OBJ, as it would end up being a spaghetti-esque mess otherwise. I had to manually rename the objects too, but that may have to be merged and renamed in case I convert this to let's say GTA San Andreas or some other racing game. 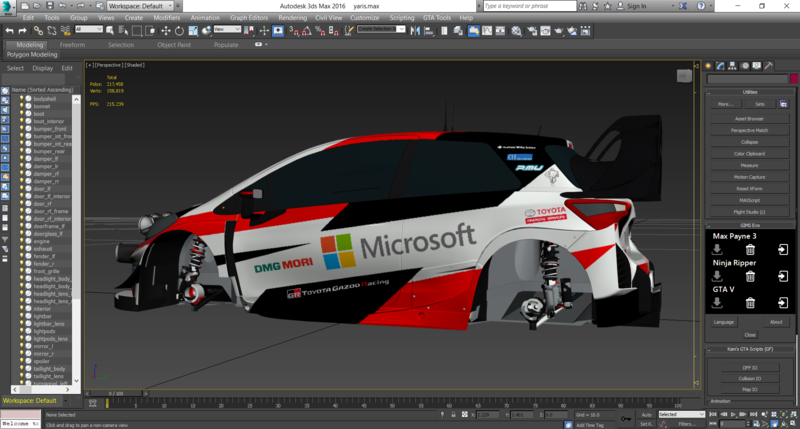 Also, the script doesn't seem to take LOD models into account. I know there are (obviously) LODs used throughout the game, and I'd like to know as there are some games which don't seem to like higher-poly cars and such. 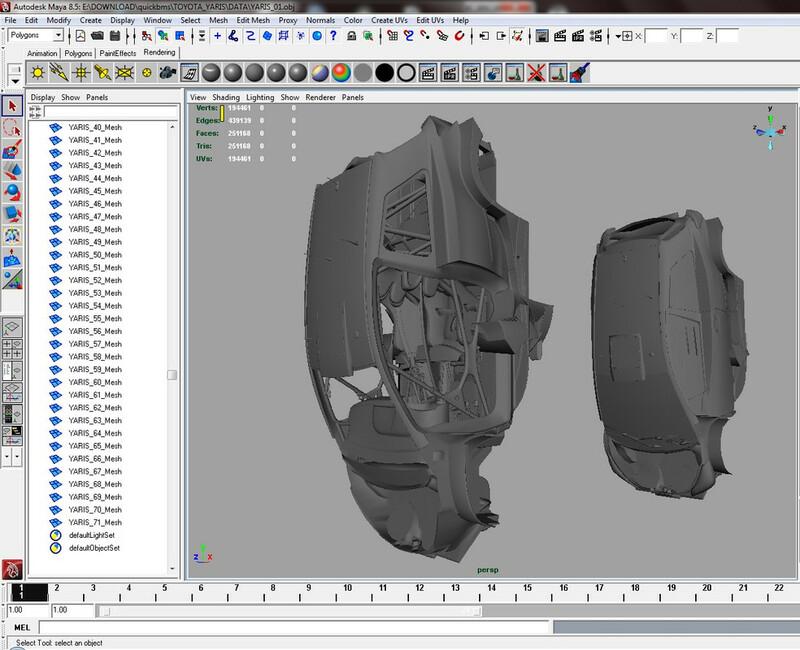 Sorry for the bump, but I'd like to know if the script could be amended to parse LOD models as well as the main mesh.